England 2011. I watched two of the Tests in that 4-match series as a fan, from the stands, living and (mostly) dying with the performance of the Indian team. It hurt. I felt my heart sink, and felt weak in my knees hearing the crowds roar as James Anderson breached through VVS Laxman’s defences in Trent Bridge. I was sad. I was disheartened. 0-4. England 2014. I watched two of the Tests in this 5-match series as a media person, from the press box. It did not matter to me whether India won or lost. I am disappointed with one-sided nature of these two Tests and that they didn’t even go past the third day. This is a professional heavyweight boxer knocking out an amateur schoolboy with just one punch. The boy never really stood a chance and shouldn’t have been in the fight. 1-3. “It’s a f***ing disgrace” said one ex-cricketer during a chance meeting when I was on a smoke break. That was in Manchester as India found ingenious ways to gift wickets to Moeen Ali as if they didn’t want to keep England waiting to go 2-1 up in the series with the hurricane fast approaching. That was before the total and complete annihilation at the Oval. I wonder what that commentator would have said after India folded up for 94 in under 30 overs in the 2nd innings of the fifth and final Test of the series. It wasn’t like this only a few short weeks ago. India are known to be poor travelers and are known to be slow starters, playing catch up in the series but yet they had drawn the match at Trent Bridge – on a flat pitch admittedly, and posted an immensely impressive 295 on a challenging wicket at Lord’s before proceeding on to register victory using short ball tactics. It was like waking up in a world where up was down, and day was night. Alistair Cook was distraught and evoked sympathy from the viewers – English and Indian alike – during the inquisition of a post-match presentation ceremony chat by Michael Atherton. He was on the edge just waiting to for the nudge to keel over – as a batsman and a leader of men. His “new era” team was falling part. His most trusted lieutenant, Matt Prior, had a foot out the door. His main strike bowler was embroiled in a controversy. England hadn’t won a Test match in ages. The lone success story from the Ashes down under, Ben Stokes, seemed to have forgotten how to hold a bat. The ghost of Mitchell Johnson seemed to be haunting them as one ordinary short ball after another was pulled perfectly to the outfielders. Then something changed. For England and India. It may have been India’s conservative attitude to sit on a lead or England’s revitalized focus due to the Jadeja-Anderson affair. Cook doesn’t know whether it was his form or his luck. But it all changed irrevocably. Edges were dropped. Lives were given and were gleefully accepted. England piled on the score at Southampton. The story returned to the usual script. Up was up, down was down, day was day and night was night. The Indian players seemed beaten. Mentally broken. Defeated and settling for the certain fate, like lambs to slaughter. 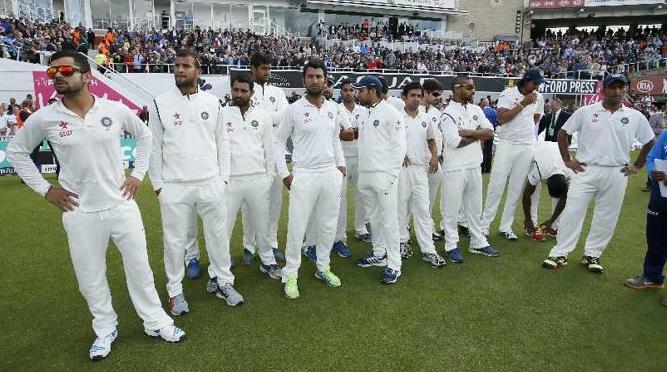 It was just a procession of men wearing cricketing whites, pads, helmets and gloves, holding a bat. They looked like batsmen but didn’t come even close to being actual Test batsmen, who are supposed to weather through tough times, absorb the blows – to body and ego, and tackle the job in front of them with renewed sense of purpose and vigor, after every defeat. Yet, what we saw was scrambled minds, cluttered thoughts, poor technique and downright pathetic display of batsmanship. Dead men walking. The 2011 series began with high expectations. Indian team loaded with stars and legends, coming off a successful world cup at home, and ranked number one in Tests, flying in from a Test series win in the Caribbean. With the knowledge of the series win in 2007 in England, India were expected to not just compete with England who were riding high themselves but even put it across to them. Then Zaheer Khan’s overworked and perhaps unfit hamstring snapped during the first session of the first Test. India bumbled from one defeat to another, piling on the injuries, recalling players who were clearly not ready for Tests. Losing the bowling spearhead put India in a deep hole that they wouldn’t climb out of but Praveen Kumar and Rahul Dravid did stand out for them, and even as the Test series was lost and the number one ranking gone, they dragged their dead bodies to the penultimate session of the final Test. They didn’t just pack their bags and get bowled out in 29.2 overs. Couple of friends of mine – India fans – in the stands admitted being afraid of buying a round of beers after lunch on Day Three because the game could be over by the time they could return to their seats. In 2011, the lament was that India hadn’t batted for more than 100 and not made a score more than 300 overs in any of their innings. In 2014, India were bowled out in less than 100 overs, both innings of the Test combined. TWICE. In the fifth Test, their team total, both innings combined, was less than 250, and at Manchester, it was just 313 runs. India didn’t go past 161 runs in four consecutive innings. That’s plumbing some new depths of batting ineptitude – and some, prompting Cook to say that despite his team’s renewed confidence after their win at the Ageas Bowl, even he didn’t think England would win the last two Tests quite so emphatically. 2011 was bad. In its immediate aftermath, 2014 seems worse. Much worse. Even for an unbiased observer. Surprising to me. For starters, Dhoni had the resources even in 2014 but kept sticking to the same old defensives strategies, in selection and in play. India did not select their best XI in any of the Tests. R Ashwin, even when picked, was slotted after in the lineup after batsmen who were decidedly worse than him. Gautam Gambhir somehow found a spot in the squad, and place in the XI, and even after twin failures, somehow, was selected again. Stuart Binny who does not warrant a place as either a bowler or a batsman – and doesn’t completely enjoy Dhoni’s confidence as seen by the trifling number of overs he sent down – was picked for three Tests while Rohit Sharma was discarded after just one Test. Then there is Ravindra Jadeja. Jadeja’s cavalier innings, based on his gumption more than his technique provided India the cushion they dearly needed for the win at Lord’s. But beyond that single innings, he was a walking wicket. His bowling has always been a defensive option and this series further confirmed that. It may have been his drop of Cook in the third Test that turned the series for the English skipper, and England. The pressure of taking wickets, and keeping the runs down, fell almost entirely to Bhuvaneshwar Kumar who was bowled in to the ground. By the end of the series, he was too knackered to even care. Mohammad Shami who promised so much more in New Zealand could find a spot after the 3rd Test. Pankaj Singh, an honest trier, was tried, and discarded. It is a worrying trend that players that show promise, and display their abilities in spades, somehow soon find themselves struggling and not performing to their best, and warming the benches. That seriously brings in to question the role of the coaches – Duncan Fletcher, Joe Dawes and Trevor Penney, and whether they should even have their jobs beyond this tour. Now Ravi Shastri has been brought in as Director and the other two are given “breaks”. What that means remains to be seen. The 2014 series began with lower expectations but the win at Lord’s provided hopes of a well-contested Test series. But the subsequent swift, sudden and steep decline of India, and the wretched nature of their defeats, leaves the game’s followers hollow. Test matches being lost in 8 sessions of play. Incredulous batting displays even as the weather gods were providing a way out. Insipid captaincy. Snoozing fielders. “Rinse, repeat” strategy. Batsmen and bowlers forgetting the discipline that staked them the series lead. Talk of processes with no accountability. Same mistakes over and over again. This entry was posted in Featured, India, Test Match Cricket and tagged Duncan Fletcher, England, India, MS Dhoni, R Ashwin, Test Cricket. Bookmark the permalink.